We are proud to announce that Accion Labs has been selected as one of the 20 most promising big data service providers by CIO Review Magazine. 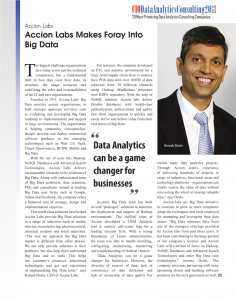 Founded in 2011, Accion Labs’ Big Data practice assists organizations in both strategic upstream activities such as evaluating and developing Big Data roadmap to implementation and support in large environments. The organization is helping companies conceptualize, design, develop and deploy commercial software products in the emerging technologies such as Web 2.0, SaaS, Cloud, Open-source, BI/DW, Mobile and Big Data. With the use of tools like Hadoop, NoSQL Databases and Advanced Search Technologies, Accion Labs delivers incomparable solutions to the problems of Big Data. Along with sophisticated team of Big Data architects, data scientists, PMs and consultants trained at leading Big Data user firms such as Google, Yahoo and Facebook, the company offers a balanced mix of strategy, design and implementation expertise. 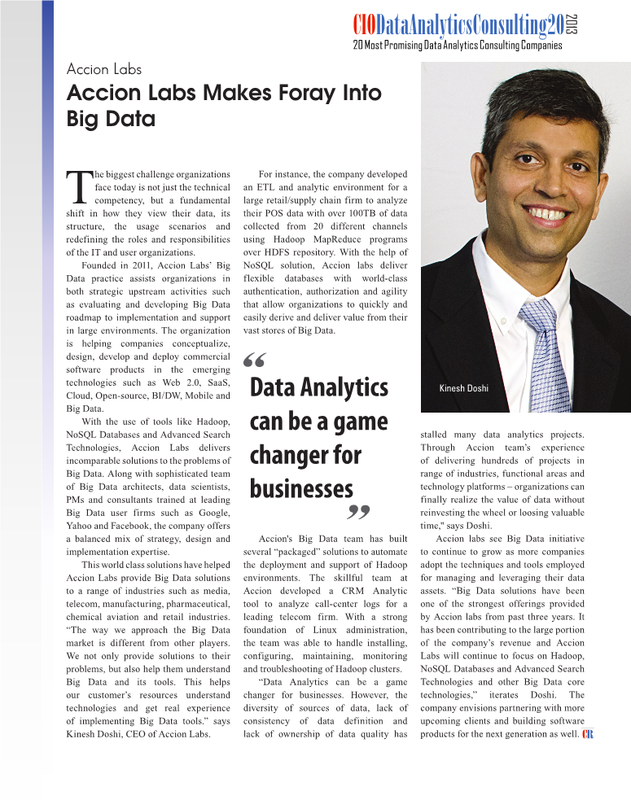 This world class solutions have helped Accion Labs provide Big Data solutions to a range of industries such as media, telecom, manufacturing, pharmaceutical, chemical aviation and retail industries. It is a great news!! !